Contamination Control Is The Only Goal. A substantial amount of time, labor, and money is invested in producing ultra-clean medical devices. To ensure that the products arrive at the customer’s site in the same pristine condition, however, the packaging must also be carefully, routinely evaluated and upgraded. Taking an existing product to cleaner and cleaner levels can be more complicated than starting from scratch with a new product. Any time a change is made to a medical product, the “Change” becomes an issue throughout the organization. “Why are we changing?” asks the marketing department. “What was wrong with the old package?” customers wonder. Validation managers, meanwhile, need to know how to present the improvement in a substantiated presentation. And you wonder why it’s necessary to go through all of this when the old package wasn’t causing any problems. The answer: Because it’s the right thing to do. Specifying the parameters of the package to ensure that the chosen vendor clearly understands the requirements of the job. While any packaging change — however trivial it may seem at first — adds additional complexity to the first step, it can ultimately provide a deeper understanding of the product as one comes to understand that product’s cumulative packaging history. Let’s assume, for the sake of discussion, that the product being packaged is a small, lightweight filter that has been in production for some time and is a leader in its application. Like most precision products, it has been steadily and substantially improved over the years. Associated with these changes have been improvements to the environment in which the product is produced and a growing awareness that the product’s packaging must keep pace not only with improvements to the product itself, but with rising market expectations. Again for discussion, let’s assume that our product has historically been packed in a heavyweight poly/Mylar-laminated bag (a takeoff from a military packaging film), chosen for its clarity and stiffness, and probably heavier than the product itself. The poly/Mylar film was made for general use, with its performance maximized for ease of sealing. It has one major drawback, however: the inner sealing layer has seal enhancing additives, usually EVA (ethyl vinyl acetate), a low-melt temperate polymer that outgasses heavily. The inner film also has heavy levels of “anti-block” and “slip” additives to give it good processing characteristics. Under normal, non-clean packaging circumstances the presence of these additives would not be a problem. In a move to cleaner packaging, however, the presence of additives will cause problems. The vinyl component of our filter’s packaging, for example, will outgas chlorides, contaminants most users need to avoid in any concentration. The other additives can migrate, acting as “wild cards” in terms of ionic and contact transfer contamination. Our hypothetical product is packaged in a pouch style bag with a three-sided seal system that adds to the problem of contamination control. So our upgrade project, therefore, must not only include consideration of alternative materials, but also an examination of other forms of bag fabrication that might offer a lower risk of contamination and, thereby, lower cost — even if the bag material is initially more expensive! Let’s also assume that the manufacturer of our hypothetical product has a long history of working with a clean manufacturing mindset. Because of this experience, the manufacturer feels that its established company standard for cleanroom packaging bags (NASA, JSCM 5322, Level 100) is reasonable and expectable for this product. Chosen for its detail and repeatability even with relatively inexpensive equipment, the NASA standard provides a standard that all suppliers can understand and makes it clear that a rigid standard will be enforced. The specification also places important demands on vendors for record keeping and lot traceability, a feature those in the medical field recognize. This manufacturer also established certain standards for the non-testable parameter of visible anomalies, which are found in all films. These standards are also set out in testable, measurable form-an important feature for vendors working to meet a manufacturer’s needs. Most applications require consideration of nonvolatile residue (NVR). For this application, NASA JSCM 5322’s Level A (1 mg/sq. ft. film) was considered acceptable. While not an extremely low level for today’s high-performance films, it is well within the tolerance of the product being packaged. While some customers would like to set higher standards for their products than are required, each level beyond the real level of need required just adds cost without producing a direct return. The requirements of cleanroom packaging alone add enough cost without taking a product to levels of protection that cannot reward such an investment with a measurable return. Ionic contamination and the product’s tolerance of different levels of ionic contamination must be investigated with accuracy and great concern, especially in applications involving electronics and high purity metals. Fortunately, the plastic-based product under discussion here is not that critical, and the confidence provided by the NVR standards will assure that it won’t suffer from outgassing contamination or contact transfer to which other materials might be susceptible. High levels of performance from a point of very low outgassing and low ionic contamination are not as hard to meet as they used to be and normally don’t require the high-cost films of the past. In this project, the lack of an anti-static performance requirement for the product package is really a windfall because of the surface transfer contamination most anti-static additives would create. The use of anti-static packaging materials for any intimate contact situation must be approached with great caution; not only can the additives contaminate by contact transfer, but outgassing of volatile components could cause chemical changes to the plastics and leave visible surface marking on a very white filter surface. As in all medical packaging challenges, moisture protection for the product must be considered. In this application the levels of protection offered by most packaging films are sufficient. But this is not always the case for medical devices, and each product must be examined for moisture-caused degradation from the standpoint of keeping a product from performing to its intended expectations. The test standard for measuring moisture, moisture transmission rate (MVTR), is expressed in grams of moisture passing through 100 sq. in. of material in 24 hr. Almost all polymers offer some amounts of protection, but the amount of protection may vary greatly. If the challenge is writing a specification for a moisture-sensitive product, a packaging engineer can help with formulas and packaging processes to help achieve the protection standards needed. In any packaging project, it is as important to be able to express your needs in a specification as it is to develop them. In all packaging challenges, durability matters. Not only must the film provide the performance levels for a clean package, but it must also maintain a level of physical protection. 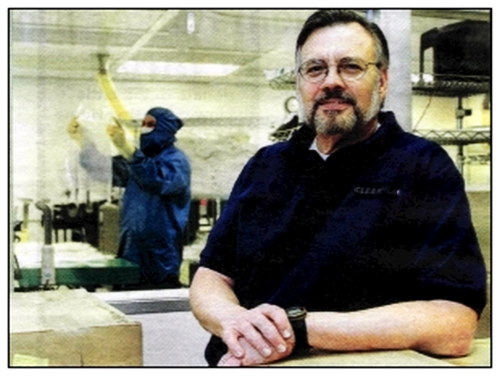 In cleanroom packaging, the goal is to maintain the quality of the product until it’s in the hands of the customer. The package must deliver the product to the user in precisely the same condition as it was in when it left the cleanroom. Strength. The ability of the packaging to physically contain the product; does the product weigh more than this packaging material can support? Abrasion Resistance. Does the packaging material have enough abrasion resistance to not contaminate the product from vibration and handling? Keep in mind that the best way to prevent abrasion is to immobilize the product in the bag by vacuum packaging process. Shape/Puncture Hazards. The shape of a product must be considered in light of puncture hazards and the chance of tearing the film while the product is being inserted into the bag. The best thing to do is test samples of each film being considered. In our packaging challenge for the filter, its physical size and weight offer almost no problems, but it does have several protrusions for the attaching of hoses and they must be considered. If a product’s shape or features make it difficult to protect, double- or triple-bagging can help. By combining several films with varied performance parameters, solutions can be developed to take advantage of the most desirable characteristics of each. Keep in mind that evaluation parameters must include cost. Every consumer knows the term “sticker shock”; in the pricing of cleanroom packaging, however, “sticker terror” is closer to what most clean packaging neophytes experience. The difference in cost between using commercial polymers and clean, high-performance, low ionic contamination, low outgassing polymers, is substantial. The cost of running a testing lab, gowning workers, and buying wipers and associated consumables adds even more to the cost of clean packaging films. The style of the bag also affects the pricing of the product; if we could change this application requirement from the three-seal style bag to a tube-style bag, much of the cost of moving to clean packaging could be saved. Performance-based, measurable parameters. If you need polyethylene, don’t limit the spec by asking for a particular resin or manufacturer; ask for a film that has the performance parameters you need. Base the need for a clear film on “haze” and “light transmission” (both have standard testing methods) and all films are rated. Not only will this approach give you better control over the product you’re buying, but it will also put the burden of performing on the vendor. The first information you need is the size and acceptable tolerances; your supplier can help by giving you normal manufacturing and material variations. With plastic film, the thickness of the material must be specified as well. Stating the composition of the material as one of the necessary performance criteria keeps you in control and helps a good vendor provide products that will work at the best possible value. Outside standards. Be sure to specify any outside standards-FDA standards, for example, or customer requirements-your packaging must meet. Choose a standard to which you can test and demand certification. It is not out of the question to ask for test results to back up the certification of cleanliness on extremely critical packaging. Special requirements. Indicate any special requirements clearly in your spec. Note how many bags per package and whether you need your bags double- or triple-packed. If you have requirements for boxing and labeling, include that information so the vendor knows all of his cost parameters. The more you explain in the specification, the better the chance of getting what you need. in the February 2000 edition of A2C2 magazine. Copyright © 2000-2019 by Stephen W. Van Someren. All rights reserved. Copyright © 1997-2019 Van Someren Associates. All rights reserved. “AeroPackaging” is an exclusive international trademark and service mark of AeroPackaging, Inc.